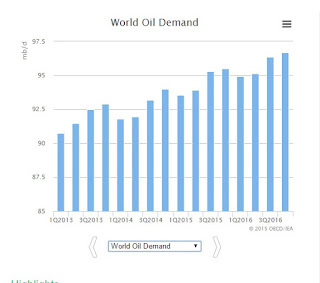 Ernst's Economy for you: More sides to every story: is the current fall of the oil price the consequence of excess supply or disappointing development of demand? More sides to every story: is the current fall of the oil price the consequence of excess supply or disappointing development of demand? One of the best economic journalists that I know is macro-economist Marcel de Boer of Het Financieele Dagblad in The Netherlands: he is well-informed, has a very large network with "the top-dogs in the business" and he dares to think out-of-the-box, which brings him to the not-so-obvious solutions. Marcel de Boer is always a good and though-provoking read and a darn nice guy on top of it. This week, in his regular column in the FD, he spoke about the three most decisive (economic) days during the last twenty years. Besides picking ‘9/11’ and the ‘collapse of Lehman Brothers’ as the most decisive days – a choice which I can fully understand even without endorsing this selection to the fullest – he chose as a third pick the decision of the OPEC made on November 27, 2014 to leave the oil tap fully open and not shrink the production of oil. Yesterday, exactly one year ago, the members of the oil cartel OPEC came together in a cold and grey Vienna in order to take a decision with far-reaching consequences. Under pressure of Saudi-Arabia, the oil ministers agreed to leave the oil tap fully open. The historical policy of the OPEC had always been to shrivel up production when prices came under pressure, but now the OPEC chose for a different strategy. It would try to force producers of relatively expensive kinds of oil – deep sea oil, polar oil and oil from tar sands and shale – out of the market. A few months of low prices would be sufficient, they thought... Afterwards, the oil price would recover. Well, the plan ended in a fiasco. 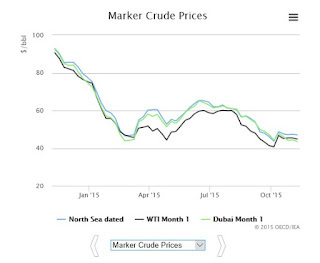 The oil price further deteriorated, but the expected rebound never showed up. This was not only due to the fact that China bought less oil, but also because Iraq started to pump up more oil and the record production in the US stayed at the high level, due to gargantuous cost savings. All these circumstances made that supply remained exceeding demand. 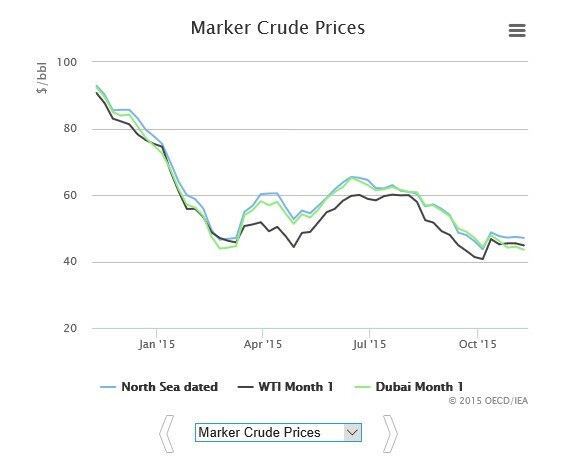 The oil price dropped from $ 110 to $45 per barrel. Well, after reading this though-provoking story, one would think that the increasing divergence between supply and demand of oil was merely caused by the excessive global production of oil, due to the ill-conceived strategy of the OPEC countries, as well as the excessive production in Iraq and the US. Yet, I was curious if the excess supply in oil was – except for the diminished oil consumption of China – really the only cause for the extremely low oil prices of this very moment. As the testing of the pudding is in the eating, I gathered some charts and statistics from the International Energy Agency and other sources and put the latter in a tell-tale chart. The first chart which I want to show is the one containing the price development of crude and WTI oil. This development has indeed been dramatical in 2015, tumbling from $92 per barrel to a mere $45 per barrel: a drop of more than 50%. 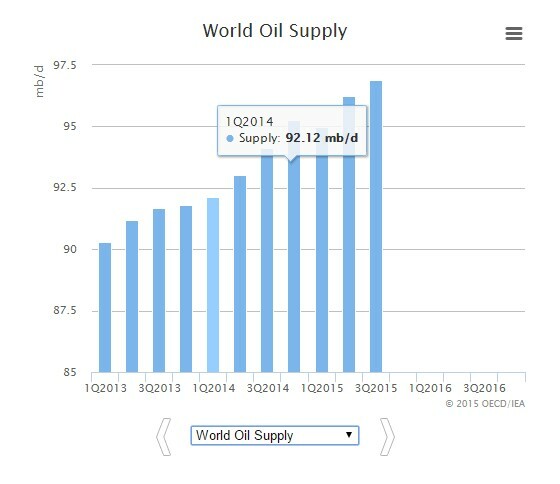 And the first question to be answered is: is the current oil production indeed extremely high from a historical point of view?! The answer: yes it is! Two charts show this: the oil supply during the last fifty years (chart 2) and the supply during the last 2.5 years ( chart 3). However, the rise (!) 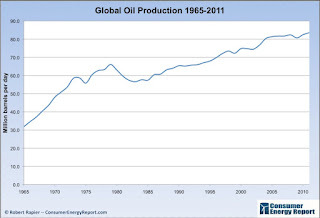 of the oil production during the last five years – although impressive – has not been extremely dramatic: on the first chart of the aforementioned two charts, it is visible that in the period between 1965 and 1975 the oil production increased from 30 million barrels per day (bpd) to 60 million bpd. This was an increase of 3 million bpd every year! As both these charts show, the oil production rose by approximately 12 million bpd during the last five years (2010 – 2015): an average of about 2.4 million bpd per year. High, but not extremely dramatic, when compared to the period between 1965 and 1975. 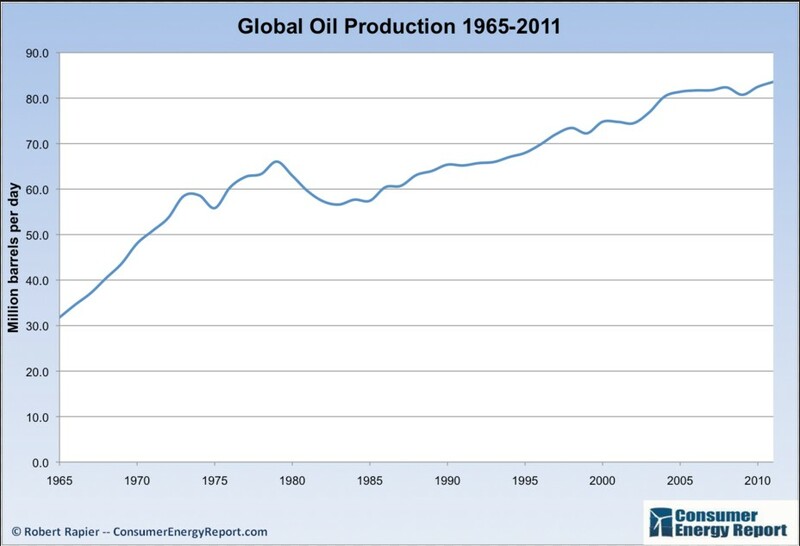 What made these production changes of the last five years so dramatic, on the other hand, was a. the fact that the oil production between 1975 and 2010 rose by an average of 0.7 million bpd and b. that these rises in production took place during the worst economic crisis of the last eigthy years. 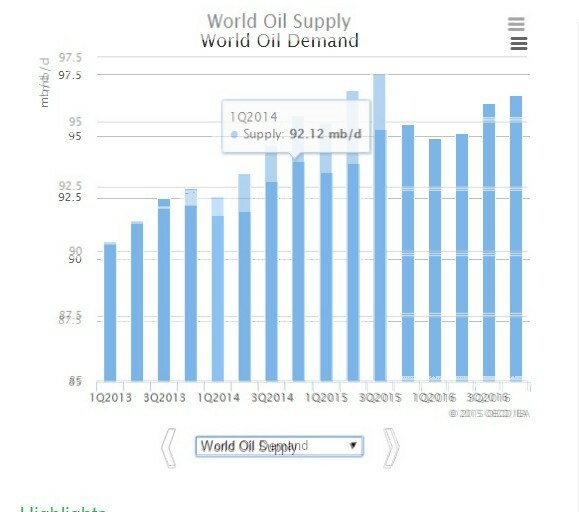 This composite chart makes perfectly clear that the divergence between the oil supply and demand is as much caused by the increased production capacity as by the “disappointing” development of the global demand for oil. 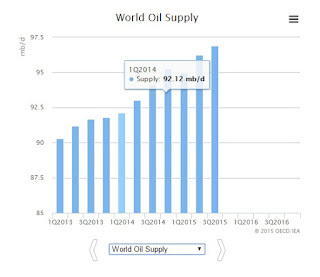 In my humble opinion, this makes 27 November 2014 a slightly less historical day than Marcel de Boer argues in his column, as the increase in oil supply has not been dramatically (!) higher since 2014Q4. Suffice it to say, that the OPEC policy has not been sensible in my point of view. The “war of attrition” that especially Saudi-Arabia fought with the other (new) oil producing countries has blown up in their faces, as the oil price is still extremely low and there are few signals that it will start to rise very soon. Especially, as Iran is returning to the international limelight. 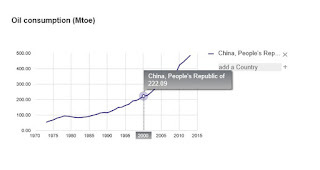 The fatal flaw that Saudi-Arabia and the other oil producing countries made, perhaps, is believing in the fairytale of the everlasting Chinese growth with the ‘magic’ 7% per year and that for a population of 1.3 billion people. The growth of the oil production has perhaps been based upon an expected demand, that was partially a figment of Chinese governmental imagination. The following table and charts are based upon Chinese statistical data from the International Energy Agency, regarding the development of the Chinese oil consumption between 2000 and 2015. 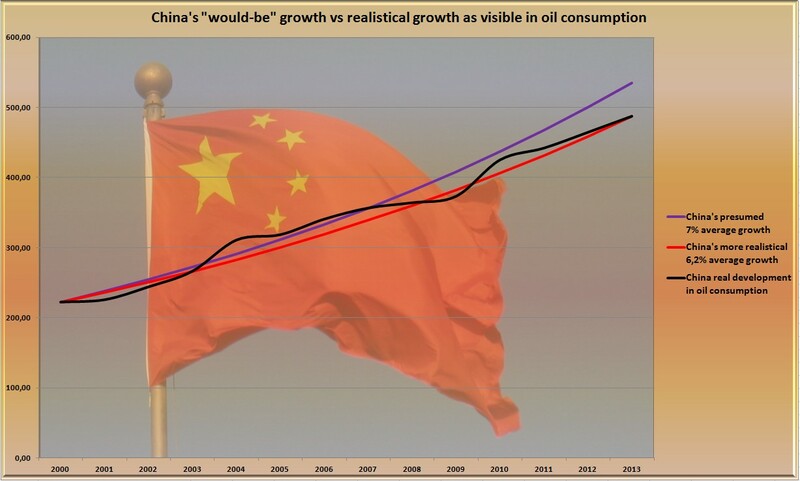 Going by the (imho) realistical preassumption that a Chinese growth of 7% per year would lead to a growth in oil consumption of roughly 7% per year or even (much) more, there has only been a 7%+ economic growth in China between 2003 and 2007, as the following three charts show. And to defend my preassumption about the correllation between economic growth and oil consumption: in a country with a developing middle class all coming from a rather poor standard of living, it seems logical that the oil consumption would grow as hard or even much harder than the economic growth, as more and more middle class people can afford to buy a car, a motor cycle or other oil consuming means of transport and/or production. 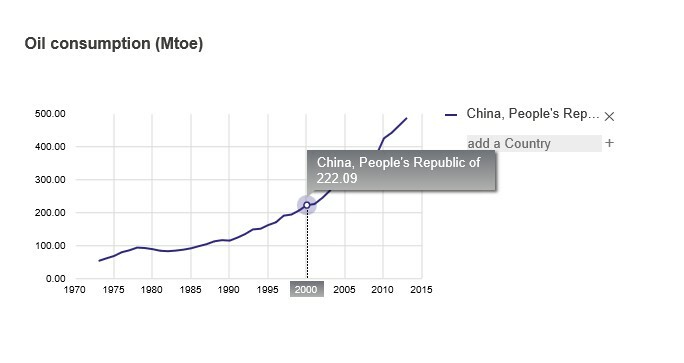 The fact that the oil consumption in China grew “only” by 6.2% per year in average, shows that the economic growth has seldomly been north of the magic 7% in China, in my humble opinion. This is a point that has been defended over and over again, by the savvy macro-economist of BNR Newsradio, Kees de Kort, based upon similar charts regarding imports and exports and production capacity. The moral of this story is that the decision of the OPEC to keep the oil tap fully open was not a wise one, as it led to an oil glut of impressive proportions. Yet, I don’t think that November 27, 2014 was the decisive historical day that Marcel de Boer called it in his column. 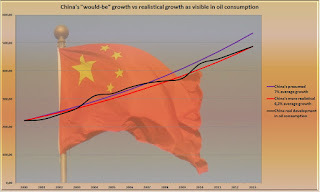 The divergence between the global oil production and consumption started already earlier and was also caused by people believing the Chinese fairytale of the magical 7% growth per year... every year!